Book Six - "Book 6-40"
Looks like we got another draconequus! I don’t think we’re getting another one. I think the baby Discord somehow possessed that scientist and the arm changing is only the first sign of a takeover. I mean, he screamed for a reason when he was shoved into that giant machine. 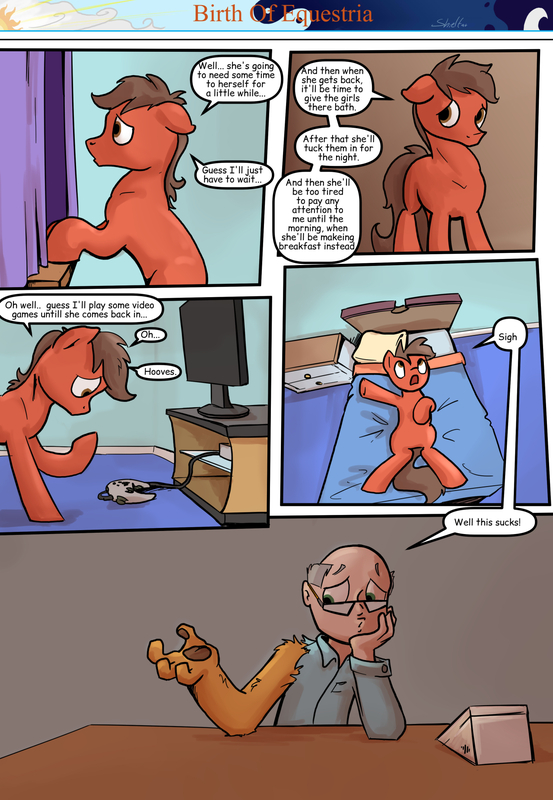 As for Mark, I wonder if he will be a sign that for most people (people who are not Grace), once they are turned into a pony, they have no way of going back. Back on page 6-06, Discord called the Director “Daddy”. So I guess Discord is getting his Daddy. I mean he may become a manticore for all we know? Pfft xD well, can’t be too easy to deny the existence of magic now! Are we sirtan that is a thing here? Ouch, sorry I didn’t see this reply until now. No, we’re not certain, but its my personal headcanon after reading one or two fanfics with that sort of thing. Also, the Button Mash Adventures short from a few years ago. Also, that’s one tiny TV. Does he play his games on a computer monitor or something? First off, check it out it’s discords origin story, eyebrows next! And second, what game console is that it seems to be somewhere between Nintendo 64 and the original Xbox, which brings up a new question, when does this comic take place? Last panel: Origin of Discord’s daddy? Will he have the same chaos magic as Discord though, I wonder? Also, I wonder if ponification wears off naturally after a while for others who are ponified by Grace? But, like, gradually it lasts longer each successive time they get ponified, until it eventually doesn’t wear off? I don’t believe it is a N64 controller mostly because of the lack of the middle part jutting out. If anything, I believe it looks more like a (please forgive me artist) a weirdly drawn controller for either the Xbox One or PS4. Hard to tell which as the left controller stick isn’t quite in the right spot for either but given the controller leads to a square-shaped game system. I’m going to go with the Xbox One. I can see the left top and bottom bumpers, the 4 buttons and both sticks. Just no power button (which I assume was an oversight.) Still this page was very good in that Mark analyzed and thought the scene out rationally while also allowing the reader where to expect the next page to be, which I assume will be the next day at this point while providing an insight into something I’m sure we’ve all been wondering. Such as, what ever happened to the poor guy that caused him to scream? Now we know! Getting part of your arm transformed would most likely do it (tho at this point, wouldn’t it be a long time? Unless this was more a recent thing?) Sorry… I feel like I’m rambling like a certain someone from the show My Hero Academia. Lol! Come on, haven’t you always wanted to have one lion paw? I mean, who hasn’t? Is there something English or British in that? So what would it mean to an Englishman to have a Lions paw? Different meaning if right or left?